Photos from the next episode of The Big Bang Theory, "The Troll Manifestation",have been added to our gallery. In this week's episode, when Sheldon and Leonard jointly publish a physics paper, they find themselves dealing with criticism from an internet troll. Meanwhile, the girls work through embarrassing moments from their pasts. Head over to our gallery to view the full album. When Sheldon and Leonard co-publish a physics paper online, they find themselves dealing with an unexpected Internet troll. Meanwhile, Penny, Amy and Bernadette spend girls' night finding each other's embarrassing moments. Pictures from the eighth season finale of The Big Bang Theory, "The Commitment Determination", have been added to our episode guide. 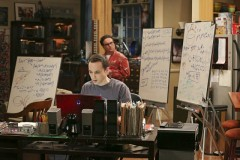 In the episode, Leonard and Penny are pressed by Sheldon to set a date for their wedding, while Sheldon grapples with changes in his own relationship with Amy. Pictures from tomorrow's new The Big Bang Theory episode, "The Communication Deterioration", have been added to our gallery. In the episode, Raj gets the opportunity to craft a message for NASA in case their mission discovers alien life, while Penny is unsure whether to audition for a movie or stay with her pharmaceutical job. Pictures from tonight's episode of The Big Bang Theory, "The Fortification Implementation", have been added to our gallery. In the episode, Sheldon and Amy find themselves in a new place in their relationship when they build a blanket fort together. Meanwhile, Howard meets a new relative, while Penny's appearance on Wil Wheaton's podcast leads to an argument with Leonard. 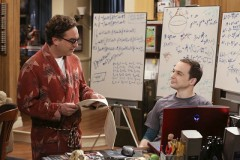 Pictures from the next episode of The Big Bang Theory, "The Skywalker Incursion", have been added to our gallery. The show is currently off air as CBS airs March Madness basketball, but it returns with this new episode on April 2nd. In the episode, Sheldon and Leonard take a detour on the way to give a speech at UC Berkeley, hoping to meet an idol of theirs. Meanwhile, a disagreement between Howard and Bernadette over the future of his Doctor Who TARDIS leads to a ping pong battle with Penny, Raj and Amy. 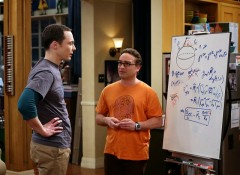 Pictures from the next episode of The Big Bang Theory, "The Colonization Application", have been added to our gallery. In the episode, Amy is angered to find out Sheldon has applied to be part of a one-way mission to colonize Mars. Penny is surprised when Leonard buys an "adult" gift, while Raj worries how Emily will react when she finds him snooping in her apartment.